During Hege’s MA project she ended up using a lot of plastic and ice. This became ironic when thinking about the situation of the world today. The performers started to look at the relation found in cold melting objects balanced between bodies on a rope. 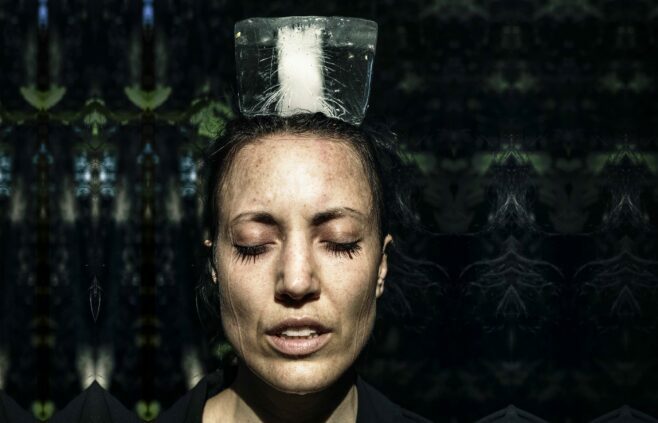 Plast is a family performance aiming to explore the interconnections between the lives of objects, audience and performers through the use of doubles rope, hair-hanging, traditional music and storytelling. To showcase, to look for co-producers and touring opportunities for the upcoming show. The first starting point of Plast was a visit to Nairobi, where Hege and Karoline trained doubles rope with Kenyan acrobats. The second starting point was the final project of Hege’s Masters in Circus at DOCH/Stockholm University of the Arts. She invited Karoline and Love to experiment in creating a living space, a secular cathedral exploring the life of objects and the interaction of objects, space, audience and performers. Now they would like to adapt it to different formats and audiences. With the support of Cirkus Xanti, DOCH/Stockholm University of the Arts.